If Loomer’s tweet is a violation of Twitter’s policy, then there are countless examples of even more egregious violations that Twitter conveniently ignores, even from blue check-marked, verified accounts. Tweets like “God, I hate white people” (Mike Drucker) and “yes I am racist! I hate white people!” (Andy Cohen). Advocating for violence against white people even comes with a few popular hash tags, including #KillWhites and #KillAllWhitePeople. Not to mention the over 12,000 tweets in February of 2017 that called for Trump’s assassination. Twitter conveniently ignores tweets like these—tweets that fit within their SJW ideology—and when users flag them as inappropriate, Twitter inexplicably concludes that this time, the “hateful conduct” clause doesn’t apply because, well, um…reasons. 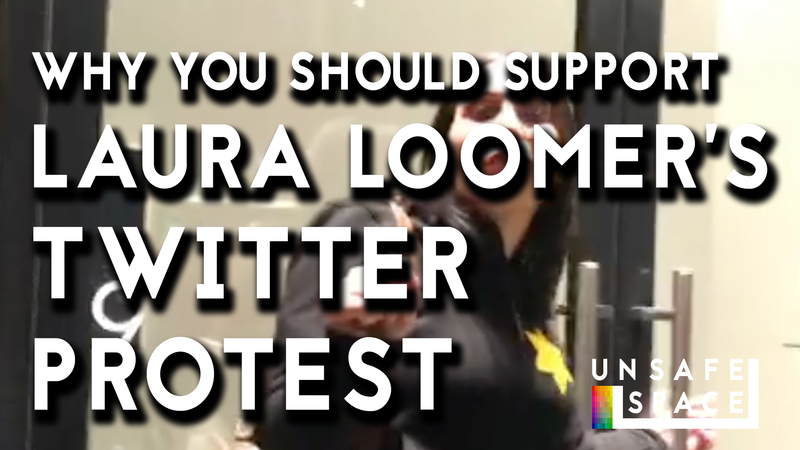 During her protest, Loomer highlighted Twitter’s blatant dishonesty and gross bias by displaying a large poster of a tweet from Nation of Islam leader Louis Farrakhan in which he referred to Jews as “termites.” Farrakhan’s account is still active, of course, because the “hateful conduct” clause is the ultimate scam. It’s not meant to be used against “hateful conduct” at all, but as a cherry-picking tool to silence enemies of the radical Marxist ideologues operating behind the scenes at the subversive tech giant. This is obvious to anyone with two or more connected neurons, and it’s why—if you are a principled advocate for the freedom of speech—you should fully support Laura Loomer’s grandstanding. Twitter summarizes its supposed values in a single sentence: “We believe in free expression and think every voice has the power to impact the world.” Free expression, huh? Shareholders, directors, employees, and customers need to heed Laura Loomer’s dramatic message: Twitter is one big, fat, lie—and a dangerous one at that.